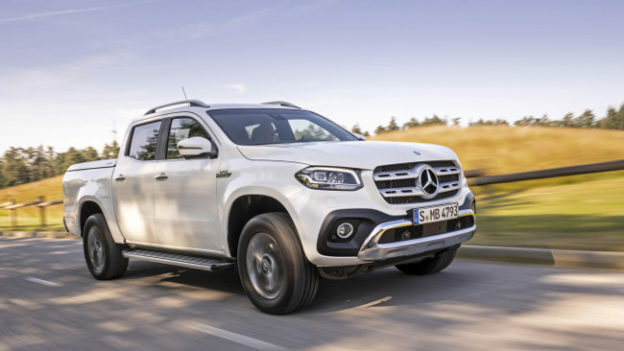 Prices for the keenly-awaited V6 version of the Mercedes X-Class pickup will start from £38,350 +VAT. The German firm says that UK dealers are now taking orders for the new model, with first deliveries expected from November 2018. As you’d expect, this flagship luxury pickup comes with a very high specification as standard. All UK models will be double cab with 4MATIC permanent all-wheel drive and a seven-speed automatic gearbox. The range-topping POWER equipment line will be fitted as standard. In fact, the POWER trim level will now only be available paired with the V6 engine. Buyers of the 200d and 250d models will have to make do with the more affordable PURE and PROGRESSIVE trim level. Highlights of the POWER specification LED headlights, electric mirrors and keyless entry and ignition will be standard. Buyers will also get include a painted front bumper and chrome rear bumper with built-in step. Drivers and front seat passengers will enjoy the comforting embrace of an eight-way electrically adjustable seat, that’s wrapped in leather and microfiber upholstery. The dashboard and steering wheel both get leather coverings, which should give the V6 X-Class a genuine luxury feel. Of course, the big attraction here is the engine. Merc’s V6 is a 3-litre common rail diesel unit with 258 hp and maximum torque of 550Nm. A modern single-stage turbo with variable turbine geometry is said to provide “particularly agile engine response”. The V6 engine will be paired with Mercedes’ 7G Tronic automatic gear box and Dynamic Select controller. This will provide no fewer than five different driving modes, including Eco, Comfort, Sport and Off-road. For more information about the new X-Class, head on over to www.mbvans.co.uk or swing by your nearest Mercedes-Benz Van dealer.